I Would like to see it in motion a bit cause I wonder if the visuals might just be a little unclear as still images. I thought of the same thing. The whole game is that level in spirit, it seems. Thanks Pizzamakesgames! 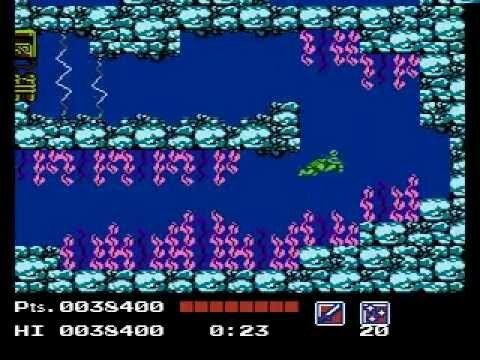 I've actually never seen that game but I looked up the level on youtube last night, that level had time limits, awkward controls from the looks of it and overall a frustrating nightmare to play. For my game though it's just simple directional controls (no tapping buttons to fly) and really will be more about exploring, maybe a few interaction puzzles, stuff like that. I'm not going to have walls that can hurt you or anything, the electric stuff in that one gif was probably the main thing that brought about these thoughts (concerns?) but there won't be much of that at all and the checkpoints will be very forgiving. When you say you'd like to see it in motion do you mean you'd like to see more moving bits in the scenery? Or did you mean I should post more gifs of the gameplay? Anyways when I have people play test it I'll be able to see what areas might need tweaking for clarity. I'm mostly focused on making new regions but once I get through that I'll focus more on making a variety of enemies and other creatures. They won't all be that crazy, many of them will be a bit more subtle or will just be a part of the environment. 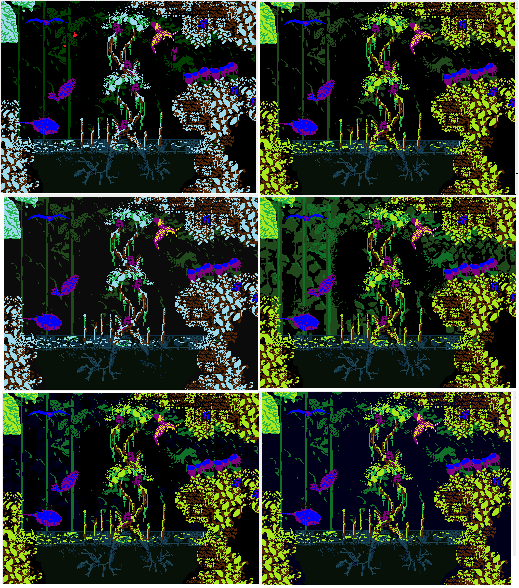 The location in this shot is just a quick palette change of another area to test how these frogs look, I'll animate them soon so I can show them in motion. That looks really damn good!!! I love that noisy and colorful low-fi style! Hey thanks Frankie I appreciate that! I haven't updated in a while, either feeling too busy or just a bit sick, but the past few days I've been organizing the scattered bits of art I've made but hadn't put into the game yet including some new enemies. Mainly still trying different combinations of art from time to time too and narrowing down what I like. 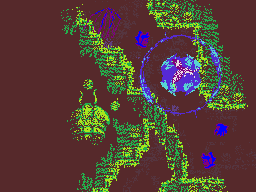 I'm now expanding on an area I kept putting off which is going pretty well. As I expand an area it helps me visualize how I'd want to connect them as the spaces between them narrow, how areas will transition, etc. Kind of a relaxed approach and just going with what feels right at the time. So I should have some new things to show soon hopefully! Thanks a lot! Also Happy holidays/new years to you guy and thanks for following/commenting, it's really nice to hear! I'm wondering what your plans are sound-wise for the game. And the music. What sort of things do you have planned out on that end? Well a few things about that. I do have a few ambient tracks I recorded when testing sounds on a keyboard, they're simple and improvised but they fit pretty well. I'd love to record some new tracks but I don't have a recorder anymore and I have no experience in using music programs. Also I'm using an old game program, the Games Factory, to make the game and I don't see any way of using mp3s as music... so I'm using shorter wav files as the music for now. Basically my life's been a bit of a mess for quite a few years now and it's gotten much worse now with my health issues (chronic pains) it makes everything much more difficult and it's hard to find time where I'm feeling well enough to focus on anything like that, it's a literal headache when it shouldn't have to be which is a bit depressing. So when it comes to trying to learn something like a music program or something newer like game maker I'd rather put it off until I get the art and and stuff done since that's much more relaxing to spend time on. My plan is to at least finish a rough draft of the game, basically I have to prioritize how I use my "free time" for now and just try to get the game itself done then I can go back and attempt to make a better version of it later. This one's probably fine for now I'd rather just move on.. spent way too much time doing multiple tweaks and by the end I just wanted to remove the whole area, it just never felt like it fit. I was just overtired, now looking at it I can see I was just overthinking things. Also I shared a link to a few short tracks from the game in the original post of this devlog if you're curious about the music. Other than that I've still been working on various bits of art. I'd love to have a playable demo soon for you guys to try but I've still got a ways to go before I have anything worth sharing. 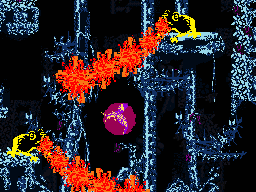 When I get more enemies working and the areas a bit more filled in then I'll try to get one ready. Hey! I am looking forward your demo. Reading your last posts I could relate with your struggles. Some times things can get really tough. So, take your time and good luck! The areas with the edited background looks great, btw. I realized a few things about the last image with the fruits and why I still find it looks a little off. The grapes could use some dark near black to add the contrast that the rest of the art has. I can get away with not having that on a lot of things since the background is usually black but up in the open blue sky areas that can makes things a bit tricky since I don't want to use too many colors. Other than that I want to try to maintain the simplicity of the first shot. Like mostly green. If I were to add something for that location I was thinking maybe something leafier or like tall blades of grass, also I want it to have more of a garden feel and less of a jungle feel. So basically I'll keep the background with the added depth but I'll probably remove the fruits. Like I might keep the pears there, make them a bit more yellow or something. 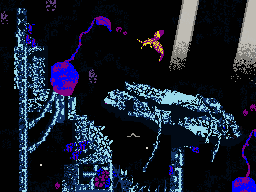 And move the grapes to darker location with the added contrast and a deeper purple. The thorned vine might work better in the brown root area since in this area they remind me too much of bramble blast. 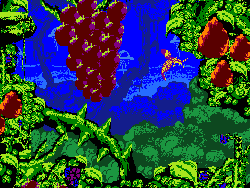 Or maybe I'll just remove them all together... basically this fruit mockup just felt too much like a different game and also gave me a bit too much of a generic feel so if I just take it apart and relocate/touch up some of the art I can still re use most of it. Anyways happy new year! I've been a bit sick during the holidays so progress has slowed down a bit but I should be getting back on track now. Here's a mock up I added to the original post a few days ago. So I was trying some other variations that I felt might fit a bit better and here's some of the results. Although I'm going to choose one that I feel fits best for this shot, I'll probably still try to find a way to use the other variations in other locations since I do like how a lot of them look. 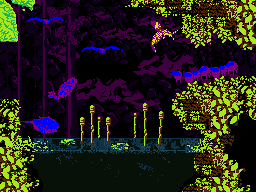 And although I am going to have an area with a purple background like that I felt like the swamp water didn't really fit with it so I tried some more natural colors for this specific shot. Something like this shot will actually work well as a transition between the greener areas and the teal and brown area with the giant seed and water I've posted before. 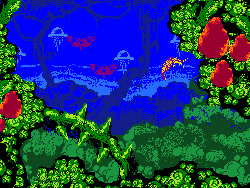 Also I am working on adding in new enemies as well, I've got the pollen stalks working and I've got these seed/vine enemies animated as well so I'll add those in soon and when I do I'll post some gifs showing how they work, for now though I'll share these mockups with them in some strange looking locations. The colors are a bit odd in these but I do really like how they kind of give a subtle glow to the scenery, the enemies especially have a nice glow to them in these with the way the colors clash. The pollen stalks shoot projectiles that actually explode if they come in contact with you, you can also make them explode if you shoot them and if enough seeds are on the screen they'll cause a chain reaction of explosions that can kill the plants themselves. The seed/vine will simply swing at you with it's vine arm if you're too close, once you shoot the vine off you have to destroy the seed quickly or it's vine will grow back. There will be another variation of this enemy that will do more than just swing at you, maybe it will grow longer or something. This shot is a bit hard to make out when not in motion but there will be a smoke/darkness that will limit your vision. The green looking enemy to the left is a bit cut off from the field of vision but it's the same color as the grass because it's non violent and is just part of the scenery. 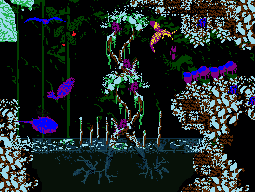 I'll post some gifs of the new plant enemies soon but for now I just wanted to share some of the progress I made the last few days. Came here through the devlog gold thread, looks super-interesting. subbed! And a big thanks to Alvarop for mentioning my game in the devlog gold thread, that was a very unexpected surprise to see and it really made my day/week! I've been planning an area that directly connects to what I already have done of the beginning area so once I've added that I'm hoping I'll have something for you guys to try. Still trying to decide on whether to add a boss for the demo or maybe some kind of scene. 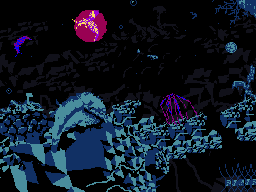 Also trying to decide if I'll have text in the game to explain the shields/controls etc. Here's some random gifs just for fun. Just crammed in a bunch of enemies here for no real reason, they won't appear in the game like this. Whole game is looking wonderful, I'm glad you're still working on this. Is it possible to actually get through all of those enemies in a small passage? Thanks! I'm really glad you like it, I'm a big fan of your work. At the moment you can but if you push through them too fast they'd kill you through the shield. I'll probably change that at some point soon. The spiral shot is in the game as sort of a secret place but I doubt I'll cram all those enemies in that area, right now there's just a few moths that make it only mildly tricky. Although to be honest I do like the idea so I'll probably place a bunch of those things somewhere else in the game like that. 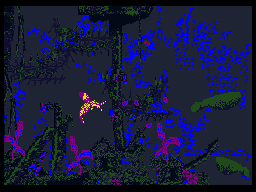 There's a lot of loose ends that are kind of overwhelming to keep track of which is why my focus has mainly been on the visuals of the game for now. I've still been struggling with my health and the chronic pain issues but if I happen to get that figured out and fixed then I can focus on the game more without it being an unnecessarily painful experience. Also I'm still working with the games factory and I don't know how much I can add to the game without breaking it which is another reason I'm prioritizing things the way I am. I'm hoping to finish enough of it to where I'll be more motivated to try and move things to a more modern program like... game maker or something. But for now everything else has been going very well and working on the less stressful aspects of the game and planning ideas out has really been a lot of fun. I just hope the game will be too! It is great to hear that things are looking up. The colours and artwork are so mesmerising and I really look forward to playing the game. Keep it up!